Congenitally corrected transposition of the great arteries (ccTGA) is a complex cardiac anomaly with an unfavorable natural history. Surgical treatment has been available for over 50 years. Initial procedures used for ccTGA did not correct atrio-ventricular discordance, leaving the right ventricle in systemic position. In the past two decades anatomic repair has been considered to be a better option. Many cases subjected to anatomic repairs would also be suitable for the Fontan strategy, which probably has a lower initial risk. The rationale for use of the Fontan operation in management of congenitally corrected transposition is discussed in this review, with comparisons to other strategies. Congenitally corrected transposition of the great arteries (ccTGA) is a cardiac lesion that has generated much interest and also some controversy over the past three decades. 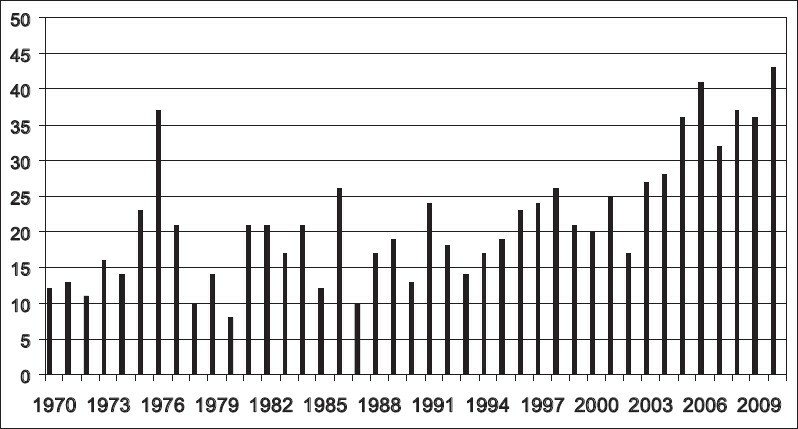 This point is illustrated in a plot of the annual number of indexed publications (PubMed) regarding ccTGA over this time period [Figure 1]. Although it is a highly variable lesion, ccTGA is known to have a generally unfavorable natural history. Unoperated patients have a 32% prevalence of congestive heart failure and a 25% mortality probability by the fourth decade of life. The time course for the development of these problems is shown in [Figure 2]. The best surgical solution for ccTGA remains debatable, and could probably be considered to be patient as well as surgeon and team dependent. The specific techniques employed will depend to a large extent on the anatomic features, which are highly variable, but team experience and philosophy are also important [Table 1]. The various strategies currently in use are summarized in [Table 2]. The options vary on the one hand from no surgical treatment, to highly complex operations such as the double switch and Senning-Rastelli. The advent of these latter anatomic corrections has provided some of the impetus for a renewed and intense interest in ccTGA, as has the availability of unfavorable longer term outcome data for the physiologic repairs used previously (see below). The Fontan operation, a time honored and universally accepted strategy for many types of univentricular hearts is another (albeit less frequently) employed option for ccTGA, and its role in the treatment of potentially septatable ccTGA hearts is examined herein. It should be stated at this point that the author, having personal experience with all of the options presented in this discussion, is a proponent of anatomic repair of ccTGA for reasonable candidates, accepting that the Fontan strategy may be equally good or better under certain circumstances. Anatomic repairs which actually correct AV and VA discordance (Senning and arterial switch or double switch) were first performed in the late 1980s by Imai, Yagihara, Mee, and others. ,, In 1990, Ilbawi described an atrial repair in combination with the Rastelli procedure for cases of ccTGA with the frequently occurring left ventricular outflow tract obstruction (LVOTO). Since that time, anatomic repairs of both varieties (double switch, Senning-Rastelli) for corrected transposition have ascended to a prominent place in our armamentarium for children with discordant AV and VA connections, perhaps even predating the availability of long term outcome data for significant numbers of patients as one might expect there may be some disadvantages with operations that combine two strategies known to generate late problems in concordant TGA (Senning, Rastelli). However, on balance the anatomic repair strategy which restores concordant AV and VA connections, is superior to physiologic repair strategies in a number of ways. There has been an enormous amount of published information regarding the anatomic details of hearts with ccTGA, most of which is no longer in dispute. The basic abnormality is AV and VA discordance, which in isolation creates neither severe physiologic derangement nor cyanosis. The main problem relates to the systemic position of the right ventricle and tricuspid valve. Neither structure is "designed" for a long-term function in a high-pressure circuit, based on blood supply, tensor apparatus, muscle fiber array, conduction system, and other factors. In practice, some type of additional cardiac anomaly is present in nearly every case of ccTGA, with a broad spectrum of severity. 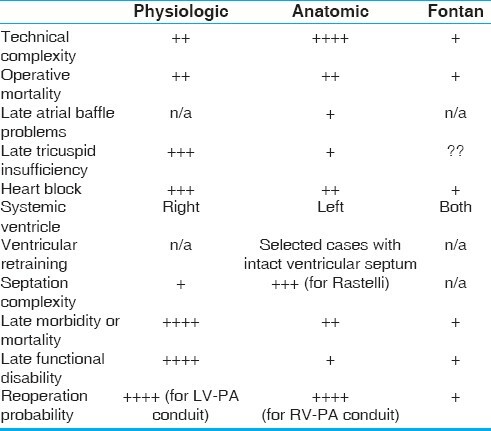 [Table 1] shows the associated anomalies typically encountered in ccTGA, highlighting those which could specifically create problems for operations that employ ventricular septation [ventricular septal defect (VSD) closure or left ventricle (LV) to aortic baffling], be it anatomic or physiologic. The other problems are generic and potentially complicate other types of operation as well. Of particular note are abnormalities in ventricular balance, LVOTO, straddling AV valve tensor apparatus, and multiple VSDs. Most surgeons will agree that the double switch operation [Senning and arterial switch operation (ASO)] relies on successful coronary translocation. From the huge experience with ASO for concordant TGA, we know that coronary anatomy other than the most frequently encountered 1LCx,2R (according to the Leiden classification) may be associated with incremental operative risk. We noted in our original cohort of ccTGA patients undergoing Senning and ASO at the Royal Children's Hospital (Melbourne), that 12 of 14 patients had a IR, 2LCx coronary pattern, which is most typical for ccTGA. However, 2 of the 14 had a single coronary arising from a non-facing sinus, a pattern that we had not seen in the first 400 cases undergoing arterial switch for concordant TGA [Figure 3]. An anatomic study that we subsequently performed at the Children's Hospital of Philadelphia, examining 20 potentially septatable SLL hearts from the anatomic collection, showed that 45% of the specimens had coronary artery abnormalities that might complicate an anatomic surgical repair. The patterns noted in this study are reproduced in [Figure 4]. Although in practice these anomalies do not necessarily preclude a successful Senning and arterial switch operation or Senning and Rastelli, they may increase the technical complexity and operative time, with possible implications for short-and long-term outcome. It would be fair to say that most experienced cardiac surgeons prefer anatomic repair for the majority of ccTGA patients. Anatomic repair is a generic term for either a double switch or Senning/Mustard and Rastelli operation, and is clearly the preferred approach for patients with good mitral valve function, balanced ventricles, a septatable heart, and reasonable coronary anatomy. Poor right ventricular function or tricuspid valve function would be compelling reasons to choose anatomic over physiologic repair, as one can almost always expect an unfavorable outcome with physiological repairs in such cases. The concept of anatomic repair of TGA patients with failing Mustard or Senning operations was originally extended to primary repair of ccTGA by Mee et al. Pulmonary artery (PA) banding for left ventricular retraining in both concordant and discordant TGA was first employed by the same group (Melbourne) in the late 1980s. It was theorized that anatomic repair of ccTGA, in restoring a physiologic ventricular pressure ratio, would result in better right ventricular and tricuspid valve function in the long term. It was noted at the time that patients who had undergone PA banding alone often had a favorable septal shift which in itself could reduce tricuspid insufficiency without performing additional surgical procedures, further supporting the authors' concept. Many of the theoretical advantages of restoring AV and VA concordance have been proven correct. However, while there is little question in the mind of most surgeons today that anatomic repair is a more attractive option in principle, the learning curve for such complex operations is an important consideration. Furthermore, ccTGA is a relatively rare lesion and most surgeons will never have the opportunity to operate on large numbers of patients. What has been achieved in selected large referral centers may not be predictive of results in units which see patients with ccTGA on an infrequent basis. Lim et al., in a Korean multi institutional study published in 2010 reported late survival and freedom from reoperation for physiologic and anatomic repairs, excluding operative mortality, for ccTGA. The authors could not demonstrate significant differences between the two strategies. Bove et al. (Ann Arbor) in 2009 noted that the enthusiasm for anatomic repair of ccTGA has largely been based on literature demonstrating poor long-term survival for (usually associated with) significant systemic artery dysfunction especially in patients with tricuspid insufficiency. It was stressed in this report that although anatomic repair can be performed with short-term outcome similar to that achieved with physiologic repair, the long-term risks and benefits of anatomic repair are not yet completely characterized. So although anatomic repairs seem to have a favorable impact on the natural history of ccTGA, a universally reliable strategy eludes us. Between the extremes of the anatomic and physiologic repairs lies the 1.5 ventricular repair strategy proposed by Mavroudis et al. for cases of ccTGA with a VSD and LVOTO. , In this strategy, physiologic type septation is performed in conjunction with pulmonary valvotomy and bidirectional cavopulmonary shunt. Complete relief of LVOTO in ccTGA is usually difficult without the use of an extracardiac conduit, due to the outflow tract anatomy and conduction system location. In this regard, the 1.5 ventricle repair appears to be an effective solution for selected cases, and does avoid the need for a valved conduit. The LV volume load is reduced by the use of the bidirectional cavopulmonary shunt, limiting the LV to PA pressure gradient. The right ventricle remains in the systemic circuit, so technically this constitutes a physiologic repair. Another operative strategy for ccTGA with VSD and LVOTO was reported by DiBardino et al. (Houston) in 2004. The strategy involves a 1.5 ventricle anatomic repair using a hemi-Mustard atrial rearrangement plus a Rastelli. Results with this strategy incompletely characterized due to a lack of multi institutional experience, but it appears to be useful in selected anatomic situations, especially for cases with a small right ventricle (RV) following septation. Lim et al. (Seoul) published a multi institutional study of 167 biventricular repair for ccTGA corrected transposition, and the group included 5 physiologic 1.5 ventricular repairs and 14 anatomic 1.5 ventricular repairs. There was no mortality in either of the 1.5 ventricle repair groups, and the authors concluded that the strategy is a useful option for Rastelli unsuitable cases with hypoplasia or dysfunction of the right ventricle. 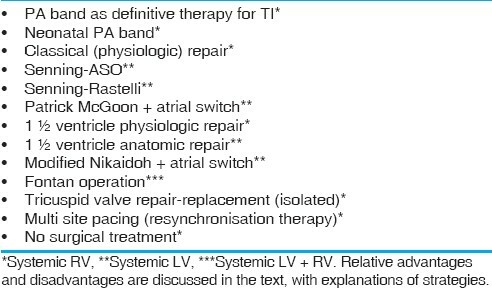 There are some possible benefits of the 1.5 ventricle repair, which are summarized in [Table 4]. The importance of these benefits will of course vary from patient to patient. The Fontan operation is another way to deal with the general problem of AV and VA discordance, committing both RV and LV to the systemic circuit. There has not been as much enthusiasm for this logical and simple solution as one might expect. This is undoubtedly due to the wave of enthusiasm for anatomic repairs that has characterized the past two decades, as well as concerns about the possibly unfavorable long-term outcome of the Fontan operation in other anatomic situations. The most accepted use of the Fontan in ccTGA is for patients with a large VSD felt to be unsuitable (or at high risk) for ventricular septation. Many such patients have a protected pulmonary circulation by virtue of naturally occurring complex LVOTO as well as good PA aborization. Others may have had pulmonary artery banding in the neonatal period, maintaining Fontan suitability later in life. The type of ventricular septal defect present in ccTGA certainly has some bearing on the suitability of a child for either physiologic or anatomic correction, and therefore, on the decision to employ a Fontan type repair. It was noted by Gaies et al. (Ann Arbour) that enlargement of the VSD is a risk factor for both heart block and early and late mortality in ccTGA patients undergoing Senning-Rastelli operations. Fujii et al. (Osaka) noted that for complex DORV (double outlet right ventricle) in general, including cases with a discordant AV connection, the distance from the crest of the ventricular septum to the aortic valve (normalized to left ventricular end diastolic dimension) was predictive of success with biventricular repair. Using stratification at the 80% level, the risk for septation could be predicted with this measurement, and the authors (a well-experienced surgical team) concluded that patients failing the test might be better palliated with a Fontan approach. In this same regard, a modified Nikaidoh aortic root translocation plus Senning and RV outflow tract augmentation might be useful in selected cases of ccTGA plus VSD with LVOTO and "Rastelli unsuitable" VSD. Reports are starting to appear in the literature regarding the modified Nikaidoh strategy in ccTGA hearts, although at this time the experience is somewhat limited. , In any case, in spite of its potential utility in selected cases of ccTGA, the modified Nikaidoh operation shares some of the problems of other types of anatomic corrections, and introduces a new variable for case selection as well. Thus, there are a number of factors to weigh in decision-making and one must consider the overall long-term Fontan outcome in comparison to the overall biventricular repair outcome. One must also consider the specific suitability of a particular patient for the Fontan strategy verses suitability for biventricular repair. Obviously, there will be many patients who straddle the two groups, and who present the greatest dilemma. Critical to the discussion of discussion of suitability of ccTGA patients for the Fontan strategy is the Fontan outcome in the current era for non-ccTGA hearts, for which there is a huge clinical experience. We analyzed Fontan mortality at the Royal Children's Hospital (Melbourne) over the period 1980-1998. It was noted that there was no mortality during the last 6 years of this experience, and also that there had been a significant improvement in results at the time of conversion to a strategy using the bidirectional cavopulmonary shunt as a staging procedure. In the current era, Fontan operative risk approaches zero in many experienced centers, owing to refinement of case selection as well as technical modifications. Longer term outcome data are also encouraging. The Fontan outcome for 220 lateral tunnel operations in Boston was summarized in a 2001 publication by Stamm et al. It was noted that there was a 91% actuarial survival at 10 years, with an 87% freedom from reoperation. Similarly there was a 91% freedom from new supraventricular tachyarrhythmia, and an 87% freedom from new bradyarrhythmia at 10 years. The sole risk factor for Fontan failure was coarctation repair prior to Fontan. In an interesting publication for the Royal Children's Hospital (Melbourne) in 2009, it was noted that the anaerobic exercise threshold for arrhythmia free Fontan patients operated with the lateral tunnel technique was relatively well preserved despite a somewhat overall restricted exercise capacity. Surprisingly this applied to patients with all types of ventricular morphologies. As has been noted in other publications, patients with the lateral tunnel procedure did better than those with an atriopulmonary connection. In this report Fontan patients, provided that they were free of arrhythmias, appear to have a normal quality of life, as reflected by various psychosocial assessment instruments used for the study. These findings may be at odds with commonly accepted thinking about the Fontan operation and its late outcome. This information leads to the inevitable conclusion that (at least in selected cases) a Fontan operation might be a better option for some patients with ccTGA, even if their hearts are potentially septatable. This is a difficult judgement call, as it has become clear over the years that the Fontan operation itself certainly does generate some late problems, but not in every case, and factors such as underlying anatomy, initial pre-Fontan palliation sequence, and other factors are important. There are always problems in a complex analysis of this type. Historically most ccTGA patients having a Fontan approach have been unsuitable for a biventricular repair strategy based on anatomic considerations. Most good Senning Rastelli candidates would also be Fontan suitable based on accepted criteria, but Fontan data in this group is actually quite limited due to the enthusiasm over anatomic repair. Also, Fontan survival in ccTGA patients might drop off after 20 years as it has for univentricular hearts in some reports, and this very late outcome data is not well characterized in the studies cited in the present analysis. The comparisons are, therefore, complicated to interpret and somewhat inferential. [Table 5] is a summary of what might be considered the advantages and disadvantages of the various strategies available to us. Tricuspid insufficiency could limit Fontan function in the long term as it has in the physiologic strategies as the valve is still subjected to systemic pressure (albeit at reduced volume load). Fontan timing and technique might have different outcome influence for ccTGA patients than for other true univentricular variants. One also wonders if a failing Fontan operation might ever be converted to a biventricular repair as a salvage option (for example a Senning Rastelli operation). These questions will not be answered in the short term, and would require application of the Fontan strategy to large numbers of patients of the type currently referred routinely for anatomic repair, making it an unlikely scenario. In conclusion, the Fontan sequence may be a reasonable alternative for selected patients with ccTGA. Certainly, the Fontan option compares favorably to physiologic biventricular repair in many patients, but it is not possible at this to time to definitively argue for or against the routine use of the Fontan for candidates who are also suitable for anatomic biventricular repairs. 1. von Rokitansky CF. Die defecte der scheidwande des herzens. Vienna: Braumuller; 1875. 2. Monckeberg JG. Zur entwicklungsgeschichte des atrioventriju-larystems, Verh Dtsch Pathol [In Centralblatt Allg Pathol Anat 24] 1913;16:228. 3. Walmsley T. Transposition of the Ventricles and the Arterial Stems. J Anat 1931;65:528-40. 4. Schiebler GL, Edwards JE, Burchell HB, Dushane JW, Ongley PA, Wood EH. Congenital corrected transposition of the great vessels: A study of 33 cases. Pediatrics 1961;27(Suppl):849-88. 5. Wilkinson JP, Cochrane AD, Karl TR. Corrected (discordant) transposition of the great arteries (and related malformations): The Society of Thoracic Surgeons Congenital Heart Surgery Nomenclature and Database Project. Ann Thorac Surg 2000;69-S236. 6. Jacobs JP, Franklin RC, Wilkinson JL, Cochrane AD, Karl TR, Aiello VD, et al. 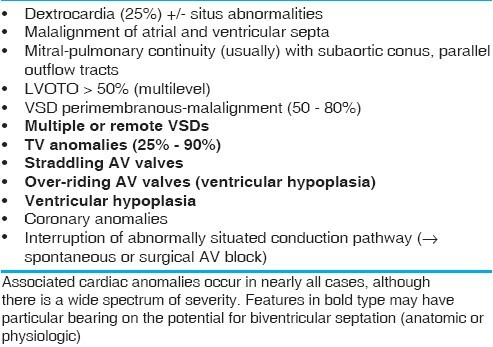 The nomenclature, definition and classification of discordant atrioventricular connections. Cardiol Young 2006;16(Suppl 3):72-84. 7. Anderson RC, Lillehei CW, Lester RG. Corrected transposition of the great vessels of the heart: A review of 17 cases. Pediatrics 1957;20:626-46. 8. Kawata H, Naito Y, Yagihara T, Isobe F, Yamamoto F, Kamiya T, et al. Surgical treatment of congenital heart disease with atrioventricular discordance. Nippon Kyobu Geka Gakkai Zasshi 1987;35:61-6. 9. Imai Y. Double-switch operation for congenitally corrected transposition. Adv Card Surg 1997;9:65-86. 10. Karl TR, Weintraub RG, Brizard CP, Cochrane AD, Mee RB. Senning plus arterial switch operation for discordant (congenitally corrected) transposition. Ann Thorac Surg 1997;64:495-502. 11. Ilbawi MN, Deleon SY, Backer CL, Duffy CE, Muster AJ, Zales VR, et al. An alternative approach to the surgical management of physiologically corrected transposition with ventricular septal defect and pulmonary stenosis or atresia. J Thorac Cardiovasc Surg 1990;100:410-5. 12. Ismat FA, Baldwin HS, Karl TR, Weinberg PM. Coronary anatomy in congenitally corrected transposition of the great arteries. Int J Cardiol 2002;86:207-16. 13. Sano T, Riesenfeld T, Karl TR, Wilkinson JL. Intermediate-term outcome after intracardiac repair of associated cardiac defects in patients with atrioventricular and ventriculoarterial discordance. Circulation 1995;92(9 suppl):II272-8. 14. Karl, TR, Cochrane AD. Congenitally corrected transposition of the great arteries. In: Mavroudis C, Backer C, editors. Pediatric Cardiac Surgery. 3 rd ed. St. Louis: Mosby; 2003. p. 476-95. 15. Cochrane AD, Karl TR, Mee RB. Staged conversion to arterial switch for late failure of the systemic right ventricle. Ann Thorac Surg 1993;56:854-61. 16. Duncan BW, Mee RB, Mesia CI, Qureshi A, Rosenthal GL, Seshadri SG, et al. Results of the double switch operation for congenitally corrected transposition of the great arteries. Eur J Cardiothorac Surg 2003;24:11-9. 17. Gaies MG, Goldberg CS, Ohye RG, Devaney EJ, Hirsch JC, Bove EL. Early and intermediate outcome after anatomic repair of congenitally corrected transposition of the great arteries. Ann Thorac Surg 2009;88:1952-60. 18. Brawn WJ, Barron DJ, Jones TJ, Quinn DW. The fate of the retrained left ventricle after double switch procedure for congenitally corrected transposition of the great arteries. Semin Thorac Cardiovasc Surg Pediatr Card Surg Annu 2008;69-73. 19. Lim HG, Lee JR, Kim YJ, Park YH, Jun TG, Kim WH, et al. Outcomes of biventricular repair for congenitally corrected transposition of the great arteries. Ann Thorac Surg 2010;89:159-67. 20. Bove EL, Ohye RG, Devaney EJ, Kurosawa H, Shin'oka T, Ikeda A, et al. Anatomic correction of congenitally corrected transposition and its close cousins. Cardiol Young 2006 16(Suppl 3):85-90. 21. Mavroudis C, Backer CL, Kohr LM, Deal BJ, Stinios J, Muster AJ, et al. Bidirectional Glenn shunt in association with congenital heart repairs: The 1 ½ ventricular repair. 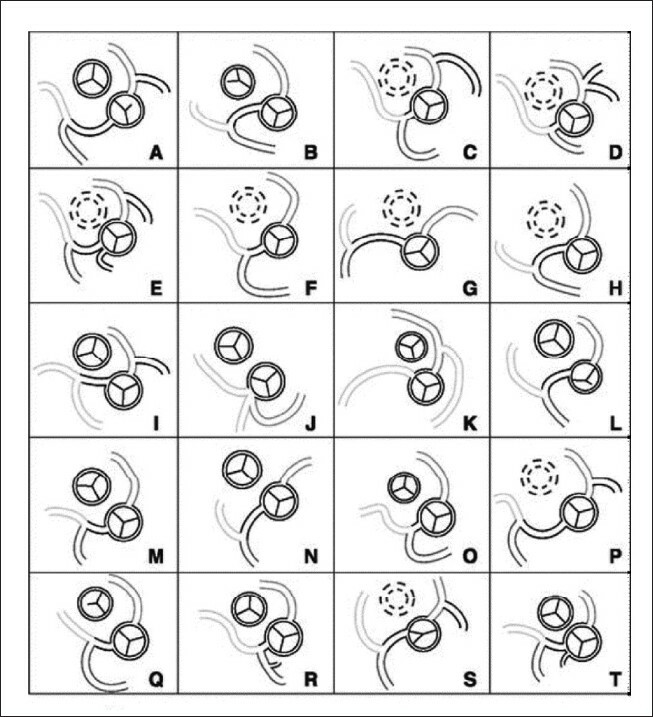 Ann Thorac Surg 1999;68:976-81. 22. Zias EA, Mavroudis C, Cook KE, Makarewicz AJ, Backer CL, Hernandez JM. The effect of pulmonary circulation hemodynamics on right ventricular unloading via the bidirectional Glenn shunt: Implications for congenitally corrected transposition repair. Semin Thorac Cardiovasc Surg Pediatr Card Surg Ann 2003;6:27-32. 23. DiBardino DJ, Heinle JS, Fraser CD Jr. The hemi-Mustard, bi-directional Glenn, and Rastelli operations used for correction of congenitally corrected transposition, achieving a "ventricle and a half" repair. Cardiol Young 2004;14:330-2. 24. Delius RE, Rademecker MA, de Leval MR, Elliott MJ, Stark J. Is a high-risk biventricular repair always preferable to conversion to a single ventricle repair? J Thorac Cardiovasc Surg 1996;112:1561-8. 25. Kleinert S, Sano T, Weintraub RG, Mee RB, Karl TR, Wilkinson JL. 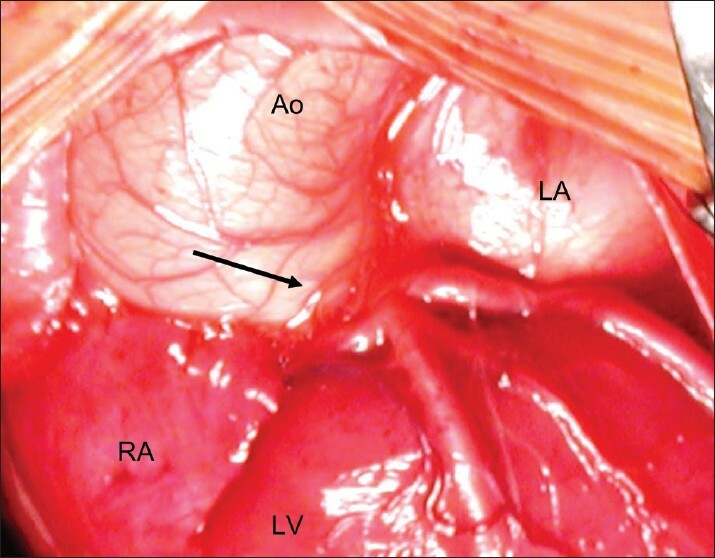 Anatomic features and surgical strategies in double-outlet right ventricle. Circulation 1997;96:1233-9. 26. Bradley TJ, Karamlou T, Kulik A, Mitrovic B, Vigneswaran T, Jaffer S, et al. Determinants of repair type, reintervention, and mortality in 393 children with double-outlet right ventricle. J Thorac Cardiovasc Surg 2007;134:967-73. 27. Fujii Y, Kotani Y, Takagaki M, Arai S, Kasahara S, Otsuki S, et al. The impact of the length between the top of the interventricular septum and the aortic valve on the indications for a biventricular repair in patients with a transposition of the great arteries or a double outlet right ventricle. Interact Cardiovasc Thorac Surg 2010;10:900-5. 28. Davies B, Oppido G, Wilkinson JL, Brizard CP. Aortic translocation, Senning procedure and right ventricular outflow tract augmentation for congenitally corrected transposition, ventricular septal defect and pulmonary stenosis. Eur J Cardiothorac Surg 2008;33:934-6. 29. Kwak JG, Lee CH, Lee C, Park CS. Aortic root translocation with atrial switch: Another surgical option for congenitally corrected transposition of the great arteries with isolated pulmonary stenosis. J Thorac Cardiovasc Surg 2010;139:1652-3. 30. Cochrane AD, Brizard CP, Penny DJ, Johansson S, Comas JV, Malm T, et al. Management of the univentricular connection: Are we improving? Eur J Cardiothorac Surg 1997;12:107-15. 31. Stamm C, Friehs I, Mayer JE Jr, Zurakowski D, Triedman JK, Moran AM, et al. Long-term results of the lateral tunnel Fontan operation. J Thorac Cardiovasc Surg 2001;121:28-41. 32. d'Udekem Y, Cheung MM, Setyapranata S, Iyengar AJ, Kelly P, Buckland N, et al. How good is a good Fontan? Quality of life and exercise capacity of Fontans without arrhythmias. Ann Thorac Surg 2009;88:1961-9. 33. Shin'oka T, Kurosawa H, Imai Y, Aoki M, Ishiyama M, Sakamoto T, et al. Outcomes of definitive surgical repair for congenitally corrected transposition of the great arteries or double outlet right ventricle with discordant atrioventricular connections: Risk analyses in 189 patients. J Thorac Cardiovasc Surg 2007;133:1318-28. 34. Hörer J, Schreiber C, Krane S, Prodan Z, Cleuziou J, Vogt M, et al. Outcome after surgical repair/palliation of congenitally corrected transposition of the great arteries. Thorac Cardiovasc Surg 2008;56:391-7. 35. Hraska V, Duncan BW, Mayer JE Jr, Freed M, del Nido PJ, Jonas RA. Long-term outcome of surgically treated patients with corrected transposition of the great arteries. J Thorac Cardiovasc Surg 2005;129:182-91. 36. Yasuda K, Ohuchi H, Ono Y, Yagihara T, Echigo S. Cardiorespiratory responses to exercise after anatomic repair of atrioventricular discordance with abnormal ventriculoarterial connection. Pediatr Cardiol 2007;28:14-20. 4 Reply to Maet al.